After two Premier League titles in as many seasons, Chelsea were searching for a hat-trick of top-flight crowns for the first time in their history. Jose Mourinho enhanced his squad with the captures of AC Milan striker Andriy Shevchenko and Germany international Michael Ballack for the season ahead. Ashley Cole also moved to Stamford Bridge in a deal that involved William Gallas going in the opposite direction to Arsenal, whose manager Arsene Wenger was celebrating his 10th year in charge. The milestone was greeted in new surroundings, as the Gunners moved to the state-of-the-art Emirates Stadium. Two Premier League draws followed the testimonial of retiring playmaker Dennis Bergkamp, but Arsenal soon got accustomed to their new home and pushed back up into the top four. Fellow London club West Ham United made the signings of Argentina stars Carlos Tevez and Javier Mascherano in the summer transfer window, but it was former Hammer and new Manchester United recruit Michael Carrick who offered the supply line for Cristiano Ronaldo and Wayne Rooney as the Red Devils set the early pace. Four goals in the opening 15 minutes in their 5-1 rout of Fulham on the opening weekend set the tone and United topped the pile with four wins from as many matches at the start of the season. A brief blip allowed early surprise package Portsmouth to reach the summit following a 1-0 victory over Charlton Athletic in September. With Sol Campbell and Niko Kranjcar in their ranks after summer moves, Pompey picked up 13 points from a possible 15 to top the table. 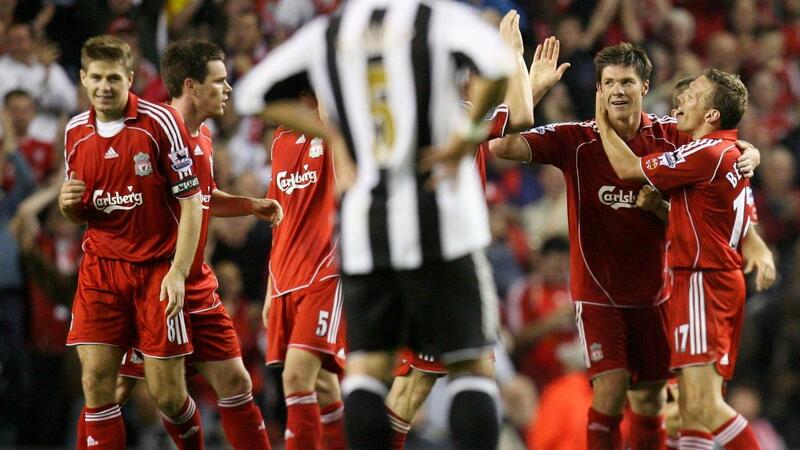 Midfielder Xabi Alonso scored from well inside his own half, despite the best efforts of goalkeeper Steve Harper as he slipped, in Liverpool's 2-0 triumph over Newcastle United. Bolton Wanderers mounted an early challenge for the top spots after an impressive start, but they were beaten by Premier League leaders Man Utd at the end of October, with Wayne Rooney netting a hat-trick as the visitors claimed a 4-0 victory at the Reebok Stadium. Bolton did sustain their top-four push for the rest of 2006 though, with Nicolas Anelka enjoying a fine start to his debut campaign with the Trotters. He scored a 25-yard screamer in a 3-1 triumph over Arsenal in November and the Trotters remained fourth at the turn of the year. United led the way, closely followed by Chelsea in second. Man Utd, with manager Sir Alex Ferguson in his 20th year at the helm, continued their relentless title charge and opened up a nine-point gap at the top of the table after winning all their matches in February. They went 1-0 down in their last match of the month at Fulham but, after Ryan Giggs's superb leveller, Ronaldo picked up the ball from inside his own half, jinked through the opposition defence and scored a late winner. By this point, Liverpool and Arsenal had established themselves in the top four, despite being off the title pace, and the Merseyside club won 4-1 when the two sides met at Anfield on 31 March. Peter Crouch settled the match with a 'perfect' hat-trick: right foot, left foot and header. The two sides stayed in the UEFA Champions League spots for the remainder of the campaign, and Liverpool reached the competition's final in May 2007. It was a repeat of the 2005 final against AC Milan, although this time the Italian team prevailed. On the same day as Liverpool's win over Arsenal, a new Premier League attendance record was set when 76,098 spectators watched Manchester United take on Blackburn Rovers. The following month, Chelsea closed in on the Red Devils after a run of nine successive wins, but a thrilling comeback victory over Everton gave United a five-point advantage going into the final three matches of the season. After Alan Stubbs' free-kick and Manuel Fernandes' powerful strike put the Toffees 2-0 up, the visitors pulled it back to 2-2 and late goals from former Everton striker Wayne Rooney and Chris Eagles sealed a 4-2 win. 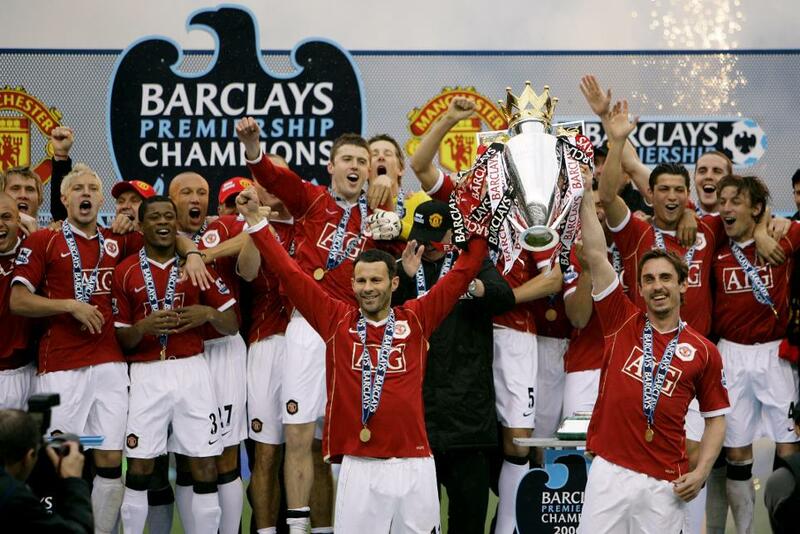 Chelsea then went on to draw 1-1 at Arsenal and United won the Premier League crown with two matches to spare. The relegation battle also came to a thrilling conclusion. Under new manager Alan Curbishley, West Ham United, who were 10 points adrift of safety following a 4-3 defeat by Tottenham Hotspur on 4 March, won seven of the final nine matches to beat the drop. Striker Tevez was a catalyst in that remarkable run. He scored seven goals in the last 10 Premier League matches, including the final-day winner against champions Man Utd at Old Trafford. That result meant Sheffield United, who were three points above the relegation zone before the start of play, directly competed for survival with Wigan Athletic as the sides met at Brammall Lane. After Paul Scharner's opener for Wigan and a brave leveller from Jon Stead, it fell to David Unsworth, who had joined the Latics from the Sheffield club in January, to score the decisive second-half penalty to win the match for the visitors and consign the Blades to relegation. Sheffield United went down alongside Watford, who immediately returned to the second tier, and Charlton Athletic, whose seven-year stay in the Premier League came to an end.